Is Microsoft making Windows worse to make it better? Microsoft has released the next version of its Dynamics AX enterprise resource planning software, giving companies a path to running more of their businesses in the cloud. The update, made available in Microsoft's cloud on Tuesday, has a new design intended to make the software easier to use, so people can get more work done. It’s all run through a browser-based portal, so people can access it wherever they are, and on any sort of device, whether that’s a desktop PC, a smartphone, or something in between. The on-premises version of the suite will be released at a later date. 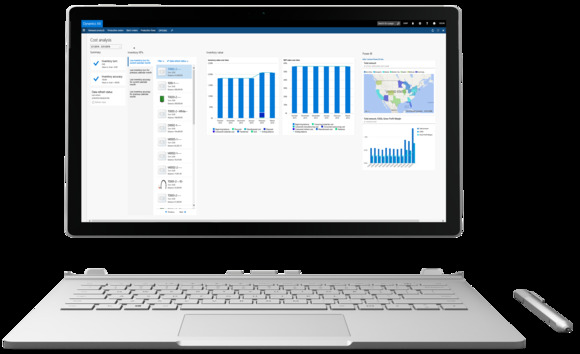 Dynamics AX also connects with Microsoft’s Power BI to do data visualization, which means users can get an easy, at-a-glance look at key business metrics, and implement custom visualizations for understanding data. Users also get additional help with complex tasks through a Task Guides feature that gives them step-by-step instructions for doing anything inside Dynamics AX. Users can also create their own guides using a Task Recorder, and share them with others. Customers also get help implementing best practices. This release builds in a Lifecycle Services feature that allows companies to test changes to their Dynamics instance without rolling them out in production. Businesses can spin up an instance to try out an integration and test what they have planned before rolling it out to employees, while only paying for the compute resources that they use. They’ll also get a dashboard that shows them the health of their Dynamics instance, and if their configurations are out of sync with what Microsoft recommends. The feature is already available for Dynamics AX 2012, but it's required for use of the new Dynamics AX. The software is delivered entirely though Microsoft Azure, and the company has spent a massive amount of time re-architecting Dynamics AX to run inside Azure. There are currently 10 companies using the cloud-based version of Dynamics AX in production, with Microsoft boasting that 50 other customers will bring their deployments online in the coming months. They’ll be supported by an ecosystem of more than 50 integrations developed by third-party software vendors that are designed to help tailor Dynamics AX for different businesses. Looking ahead, Microsoft will also have a version of the new Dynamics AX that can be run on-premises, like its predecessors. That’s on hold until the company releases its Azure Stack private cloud administration software, which will allow businesses to turn servers they own into an instance of Microsoft Azure that can be used by applications in the same way that they access the Azure public cloud. Dynamics AX joins Microsoft's other cloud-based business products, including Power BI, Office 365 and Dynamics CRM Online, which are all aimed at letting businesses get away from running on-premises applications and focus on using Microsoft's cloud.